South West View of Chester Cathedral. This was originally an abbey church, the abbey for which was founded in 1092 by Hugh Lupus, Earl of Chester. 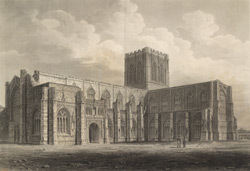 After the abbey was dissolved, the church was promoted to the status of a cathedral by Henry VIII. Daniel Defoe commented that 'The great church here is a very magnificent building, but 'tis built of a red sandy, ill looking stone ...We saw no monument of any note, which is partly occasion'd by its remote situation, and partly by its being but a modern bishoprick'. This view is of interest because it shows the cathedral before its extensive 19th century restoration. This picture is by John Buckler F.S.A. an architect and prolific topographical artist of cathedrals.